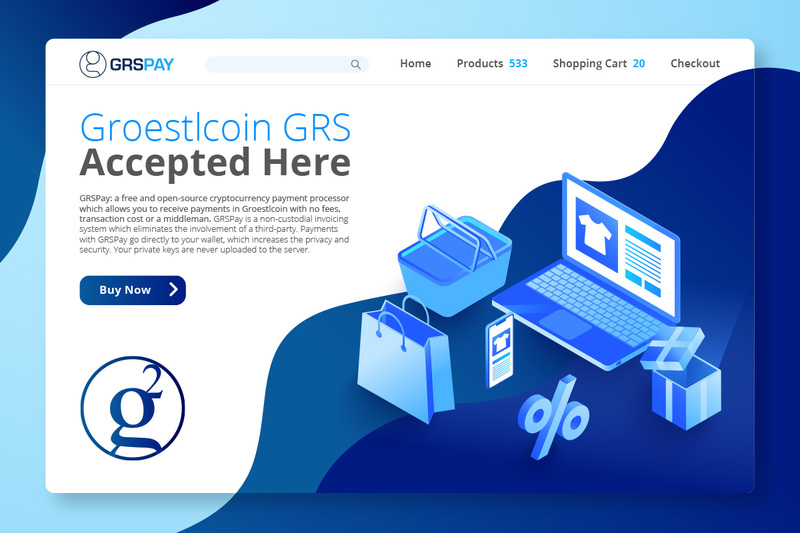 GRSPay is a free and open-source cryptocurrency payment processor which allows you to receive payments in Groestlcoin with no fees, transaction cost or a middleman. GRSPay has an internal wallet which you can use to see the transactions and even send the money out of it. The wallet works only with Ledger Nano S and Ledger Blue hardware wallets. You'll have to confirm and sign the transaction on your hardware wallet. GRSPay wallet is not a hot wallet. The private keys are secured inside your hardware wallet. GRSPay is a non-custodial invoicing system which eliminates the involvement of a third-party. Payments with GRSPay go directly to your wallet, which increases the privacy and security. Your private keys are never uploaded to the server. There is no address re-use, since each invoice generates a new address deriving from your xpubkey or zpubkey. • You can run GRSPay as a self-hosted solution on your own server or use a our host. The self-hosted solution allows you not only to attach an unlimited number of stores (and soon use the Lightning Network) but also become the payment processor for others. ### How to use WooCommerce store with GRSPay? ### Why can't I just give my Groestlcoin address to a buyer? Re-using the address for receiving payments is a privacy issue. Providing a different address manually to each customer is not an optimal solution. Imagine having to send an e-mail that wants to pay you with cryptocurrency. GRSPay solves the address re-use and automates the checkout process. The software is a complete, automated invoicing system. It integrates into your checkout process and customers can pay you in Groestlcoin in few clicks. After the payment, the software notifies your store that the order has been paid/completed. Depending on the e-commerce software you're using, it can also change the order status. You worry about getting items shipped, leave the invoicing and payment processing to GRSPay. ### Does GRSPay need my private key? Absolutely not. The fact that GRSPay never needs access to your master private key for on-chain transactions is a huge security advantage. Even if our server gets hacked, your funds from the on-chain transactions are always safe. Securing your on-chain funds, comes down to your own security. When we will support lightning node, GRSPay technically will have access to the keys (macarons) of your LN. ### Address re-use - How GRSPay creates a different address? GRSPay generates a different address for each invoice. The address is derived from your xpubkey or zpubkey. Your private keys are never uploaded or required by GRSPay. The software only needs your extended public key. You can create your private key in your software or hardware wallet and import the public key (xpub/zpub) into GRSPay so that it can derive addresses from it. Meanwhile, you should stick to the best practices for protecting your private key. ### What e-commerce integrations are available? ### Do I need to have an online store to accept Groestlcoin? You can use GRSPay even if you don't have an e-commerce store. You can launch your GRSpay and be the payment processor for your friends or local market. Another use-case is to accept donations through the POS (Point of Sale) app or payment buttons which can be copy-pasted as HTML snippets into any website. ### Does GRSPay Server support groestlcoin to fiat conversion? At this time, it is not possible to instantly convert your payments into fiat through GRSPay. ### Does GRSPay Support Lightning Network? No not yet but coming soon. ### What is a "network cost"? Network cost is a feature in GRSPay which protects merchants from a customer who pays the invoice partially. When an invoice is paid from many outputs, the fee for a merchant to move those funds will be higher. For example, your customer created an invoice for 20$ and paid 20 x 1$. You as a merchant now have a larger transaction which increases the mining cost should you decide to move those funds. GRSPay applies a network cost after the first transaction, to cover for merchants expense. The network cost in GRSPay is not the same thing as the mining fee. Your customer would still need to pay for the miner's fee. The network cost is an optional feature. It's enabled by default, but it's entirely up to a merchant to enable or disable it. Your customers will be able to see this "network cost" at the checkout when they expand the invoice information. While it protects dust transactions, it can also reflect negatively and your customers might have additional questions and may lead them into thinking you're overcharging them. Please think twice about how this may affect your business and make sure to communicate it to your customers properly inside your store Terms of Service or by other methods. ## Invalid Status Code:301 when pairing the store with GRSPay. If you're getting this error, this means that you have not connected your wallet to GRSPay. In Store>Settings> Derivation Scheme, on the right-hand side click modify and set up your derivation scheme correctly. 1. Are you able to register at GRSPay Testnet? 2. Are you able to create a store? 3. Are you able to create an invoice? 4. Are you able to create a POS? 5. Are you able to receive payments through GRSPay Testnet? 6. Are you able to setup your derivation scheme? 7. Are you able to setup 2 factor authentication? This application is licensed under MIT. There is no warranty and no party shall be made liable to you for damages. If you lose coins due to this app, no compensation will be given. Use this app solely at your own risk. 3. Post reports of errors in this topic.